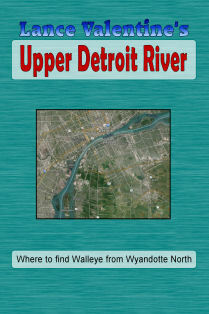 This "Where To For Walleye" Series DVD covers the upper Detroit River from Wyandotte to the Lake St Clair. Learn hot spots, review depth maps, learn proper techniques, get some of Lance's best waypoints and more. This brand new DVD will teach you more in one hour than you can learn in several years fishing with your buddies. Catch more walleye when you hit the Detroit River this spring! I am unfamiliar with the Detroit River. Because of this video, I am now fishing the Detroit River and in the zone. Thanks to Lance Valentine, I now know key spots based on his professional angling experience and he also provides waypoints to some of the best locations on the river. The video provides how to and where to for each location!! Get your copy today, you won't go wrong.